Before the integration to the MetroCloud platform began, the City of Sycamore’s 4.9 MGD Wastewater Treatment Plant SCADA system was operating on (2) Dell servers using Windows Server 2003 that were originally installed in 2005. The servers were very large, noisy, outdated, and unreliable which lead to reoccurring costs related to SCADA server’s maintenance starting to spiral out of control. The previous integrator used iFix for the SCADA software solution combined with WIN911 for alarm notifications. The old SCADA system could be viewed by either of the 2 Poweredge servers in the office, or at any of the 4 remote desktop PC’s at the remote buildings. The PC’s ran a thin client application that allowed them to view a mirror of the main SCADA servers in the office. One problem was the existing PC did not utilize a touch screen, therefore operators would have to navigate through the system using a keyboard and mouse that was tucked away inside the control panel. If an alarm occurred, the two separate software platforms had to work together to dial out to the operator’s phones to let them know an alarm exists. This system was not connected to the internet, and therefore not able to be accessed remotely. 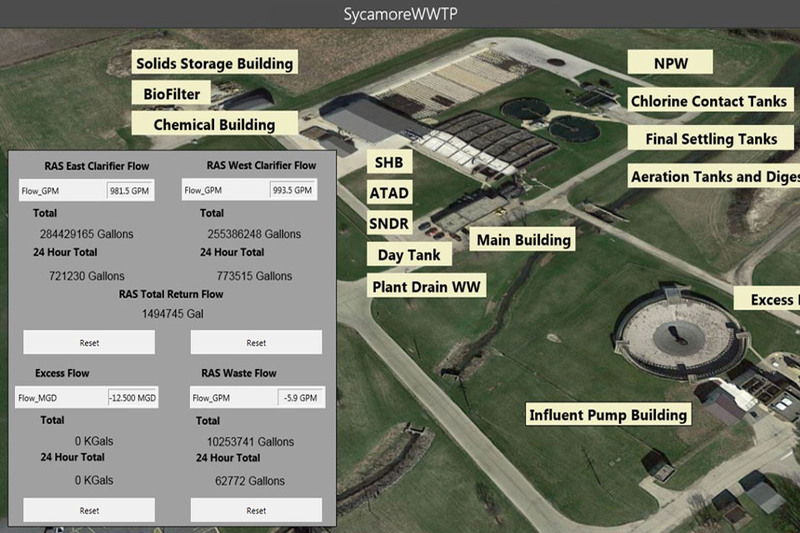 At the time Sycamore’s WWTP was composed of 4 main buildings; Influent, Blower, Solid Handling, and Thickener. All of their existing controls were done by a previous integrator, and each building had its own PC and interface screen. The influent building has an Allen-Bradley CompactLogix PLC with a Panelview Plus 700 that controls 6 influent pumps, as well as their slide gates, screen press, fine screen, and bar screen. Most of their plant communicates over Ethernet, with the exception of the influent building PLC. The influent building communicated to the rest of the plant over Ethernet radios. The owner chose to run a fiber optic connection from the influent building to the office, eliminating the radio link. This would leave the entire system directly connected together, helping alleviate telemetry issues. The blower building also had an Allen-Bradely CompactLogix PLC with ENET adapter to connect to a remote I/O panel nearby. The solids handling building Compactlogix PLC controlled their chemical feed process as well as their NPW (non-potable water) system. The final Compactlogix PLC controls their centrifuge and thickener, as well as communicated to the ATAD and SNDR processes which included system controllers from a 3rd party manufacturer. The plant also had 4 chart recorders to record the flow from 6 different flowmeters. The plant had to continuously change out the chart papers and seemed to always have issues with the recorders not working and were looking for a solution using a PLC with archiving capabilities. In the beginning of the integration, Metropolitan added a dual WAN router to the plant to utilize their current internet connection as well as a cell modem in the event that their current internet connection went down. During the design of Sycamore’s new SCADA application, we worked closely with their old SCADA system. 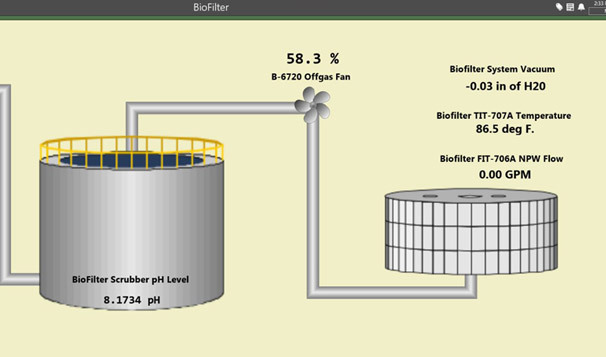 By learning how the operators are presently controlling their plant, we were able to design our new application to have a familiar feel. This ensured that the operators would not have a steep learning curve after the transition. While designing the application, we also provided networking assistance with the new fiber optic line being connected from the influent building. By helping the owner choose the correct switches and helping connect the system once the fiber run was in place, we were able to make sure that the system remained operational during the changeover. Once the SCADA system was complete we provided training sessions for the city personnel. During this time we taught the operators how to use the new system and showed them tricks that their old SCADA system did not have in order make their daily job easier, including; how to make trends, create tag groups, as well as manage their new alarm system and dialer. The operators had a few suggestions, such as making certain information was more accessible, which we were able to do without issue. Suggestions were implemented on the spot, and the operators started using the new system immediately. While the operators were using the new MetroCloud SCADA, we began designing a new HMI for the operators. Since their old system involved a remote desktop connection to the Windows 2003 Servers (which would soon be gone) we needed to provide a way for the operators to view their plant status in each building. Using Delta 10” touchscreens, we created a simplified version of their SCADA system, so that the operators would have a familiar view regardless if they are looking at SCADA or the local HMI’s. We installed 4 HMI’s in total, one near each of the controlling PLC’s. Each HMI was able to talk to any PLC in their plant over their Ethernet network, allowing the operators to make changes to any process regardless of where they are. Next, we tackled the chart recorders. Using an Allen-Bradley Micro820, we connected the PLC to the existing 4-20mA signals coming from the flowmeters to record the flow values inside of the PLC. We now are capable of totalizing the flow values for each meter, giving Sycamore both a 24-hour flow total, as well as a cumulative total. Using the MetroCloud, Sycamore can trend these values over time to get a better understanding of their processes, without needing to compare multiple charts together or worry about losing / damaging the paper charts as used in the past and making searching for specific dates much easier. Now, the operators are able to remotely access their new MetroCloud system from anywhere. Using tablets and smart phones around the plant, as well as laptops and desktop computers, they are able to make changes to the system and quickly and accurately diagnose any issues that may arise. If their local internet connection from their internet service provider goes down, the cell back up connected to the dual WAN router automatically takes over, allowing the operators to continue to view and manage their system until their internet connection returns. In a few short weeks, Sycamore’s wastewater facility went from out-dated to cutting edge. With the MetroCloud in place, the City of Sycamore can finally rest easy knowing that their plant is operational, accessible, and ready for the future. Preparing to Upgrade Your City's Wastewater Treatment Plant? We’d love to discuss your existing wastewater monitoring capabilities and the possibilities of what the integration of cloud SCADA can do for your. Stay current with occasional MetroCloud updates by email.